The NCAN presenting a cheque of N45 million to Adams Oshiomhole. Bounce News brings you the hottest headlines on social media and beyond. When you live in Nigeria you cannot blink, because something is always about to happen. You must keep your eyes glued to your phones or computer screens, or you just might miss it. However, if you happen to miss anything, Bounce News has got you covered. After sharing the cover art and track list, of his upcoming album 'No Bad Songz', Kizz Daniel has unveiled the project's guest acts and producers. Two weeks ago, the "For You" singer shared the titles of all the project's 20 tracks, and for a second we thought he'd be carrying the entire album all by himself. Well, that's not the case, as he just revealed the artists he'll be featuring: Simi, Major Lazer, DJ Xclusive and more. As far as the 2019 presidential election is concerned, President Muhammadu Buhari has crossed the first hurdle. It no longer matters to him that the cost of the nomination form for the presidency is beyond the reach of many aspirants. 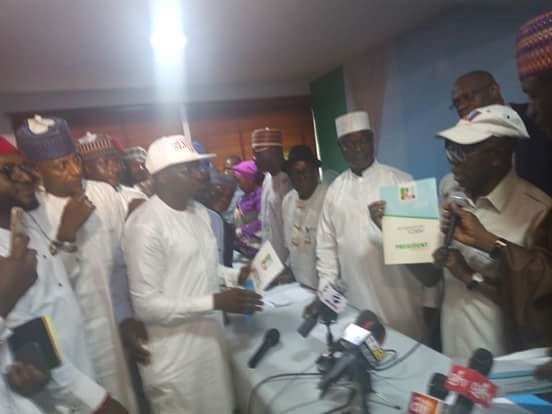 On Wednesday, a pro-Buhari support group, the Consolidation Ambassadors Network, NCAN, obtained the presidential election nomination forms on behalf of the president who is currently in China for the Forum on China-Africa Cooperation, FOCAC summit. The group paid the mandatory 45 million naira for the expression of interest and the nomination form. The first time you set your eyes on Nollywood actress, Anita Joseph, you would literally know that she is the full bakery, and not a snack. She had shared a photo on her Instagram page to refute claims that she was dating a married man and emphasised that curves and other packages that catch the eyes, were pointers to the fact that had all the right ‘potentials’ to be ‘main chick’ (full bakery) and not a ‘side chick’(snack). Anita Joseph was recently accused of dating a married man who bought her a house in South Africa. Even though grew up in a mansion, he still has the sharpness of a street boy. The leader of the 30-Billion-Gang says he outsmarted 50 policemen sent by his father to arrest him and his promoters during his first ever show. The superstar singer revealed this during a recent interview with The Breakfast Club a popular American radio show. He is currently in America on his 'Locked Up' music tour. Many of his fans did not know the extent of Davido’s billionaire father’s dislike for his son’s pursuit of music at the beginning of his career. No one remembers because his father is presently his biggest supporter. Fans also took time to make fun of his American accent on social media. Winner of the now rested MTN Project Fame Olawale Ojo has reportedly paused his musical career to become a cab driver. This was made known by Tope Delano, a writer, who had a sit and talk with the reality show winner and posted the narrative on Instagram. Ojo told Delano that he decided to take on the cab-driving job in order to raise enough money to fund his studio sessions. Olawale Ojo, had received the sum of N5 million, an SUV and a recording contract after winning the 2013 edition.